On 11th January 2015 fourteen of us from the Ray Valley Benefice went to Exning, Suffolk to be present at the Licensing and Installation of Rev. Andrew Rycraft at the parish church of St Martin. 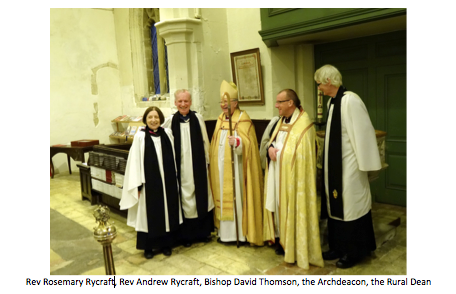 The service was conducted by the Right Reverend Dr David Thomson, Acting Bishop of St Edmundsbury & Ipswich, assisted by the Archdeacon and Rural Dean. Exning is a large village, 2 miles north of Newmarket. Andrew is the Priest in Charge and his parish includes a large area on the outskirts of Newmarket. He has a modern, detached house in the village, next door to the Wheatsheaf Public House – what more could a man ask?